The rise of working from home, or basically anywhere that isn’t the usual desk-plus-chair setup (looking at you, treadmills, bean bags and exercise balls) has been astronomical in recent years. Whether that’s for better or worse, we couldn’t possibly comment. What we can do, however, is recommend the best lap desks on the market, the ones that can turn your place, or any place you like, into an office. Some lap desks have optimised angles to keep everything aligned and help to prevent the onset of painful RSI or any other posture-related unpleasantness, integrated mouse pads for just-like-the-office realism, built-in slots for your phone or tablet, and even ventilation holes for laptops that are prone to overheating. If there’s one thing it’s important to take note of, it’s the size of the desk, so we’ve handily listed the dimensions of each of our picks below to avoid any hilarious but frustrating sizing errors – owners of laptops above 15 inches, take note. After that, the choices is all yours. 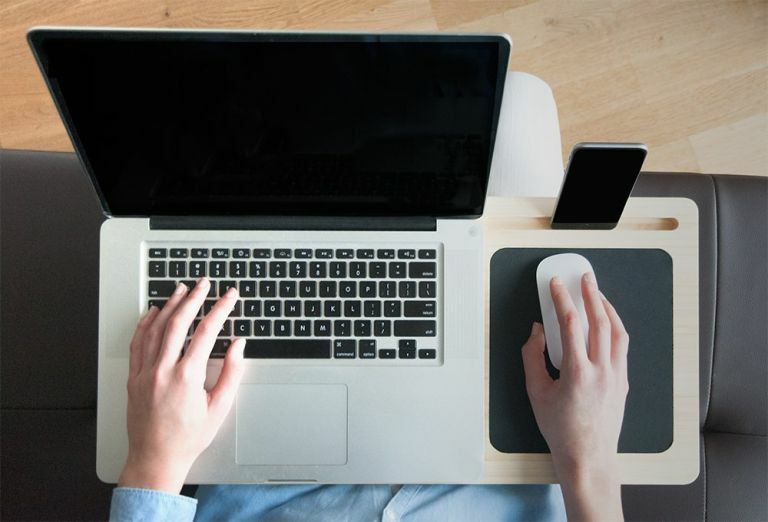 Some are firm, some are soft; some are minimal, some are even a little kitschy – whatever type of desk takes your fancy, have a glance at our list of the best lap desks before you buy. If you’re not one for bulky bean bag or cushioned lap desks, this sharp-looking option is the one for you. This is the best lap desk for daily use. Its anti-slide work surface is large enough to handle laptops up to an 18.4 inch screen size, yet the whole thing is still slim enough to not stand out, making it the ideal option for working comfortably on your commute. It’s also suitable for longer stretches at the screen, lifting your laptop to the optimum angle to keep wrists and hands in a comfortable position – very impressive for such an unassuming-looking piece of equipment, and even moreso for the budget-friendly price, a combo that earns it our top spot. A non-slip lap tray is a wonderful thing, and not just when it comes to working – the surprisingly grippy willow wood surface of this cushioned tray makes it great for drinks, snacks and papers as well as laptops, with reviewers saying its large surface had proved ample for dining and drafting alike, although one or two thought it was on the heavy side. That the cotton cushion cover is removable and machine washable is an added bonus, a nice alternative to solid-bottom trays which can scratch, scuff and look worn in seemingly no time at all. If you like a product that looks good and does good – its sustainable bamboo construction makes it the greenest on our list – then look no further than this lap tray. It’s ultra versatile, letting you stand your phone or tablet in the groove above the integrated mousemat while leaving space for an up-to-15-inch laptop, and comes with drilled-in ventilation holes to avoid overheating. Unfortunately, that sleek design means there’s no room for a leg-saving cushion, but users have found it to be fantastically light, so it shouldn’t prove too much of a problem where comfort is concerned. We all know that lap desks can look functional, sure... but elegant? Well, if you’re in the market for a demure-looking lap desk then you may be pleasantly surprised, because this Gentlemen’s Society tray is just that. It’s all black and all business, with a deep, plush cushion for extra comfort whether you’re working at home or on the go, while the surface is moulded to stop pens and pencils rolling off while writing or drawing. Plus, it’s super inexpensive, making it a great deal for a sleek looking lap desk. Find trackpads unwieldy? Get dextrous with this lap tray’s swappable mouse pad. If you’re one of those people who simply can’t get along with a trackpad, this lap tray might just be your best bet for working on the move. It has a retractable mouse tray for right-handed and left-handed users, complete with mouse-stopping barrier, and an anti-slip covering to keep laptops and notebooks secure on bumpy rides. Even so, it remains small enough to fit into a laptop bag, so it’s an all-round winner for travel – unless your laptop is over 15 and a half inches. The best lap desk for travel on our list and packs some handy features to boot. Trust Not on the High Street to make even something as seemingly standard as a lap tray adorable – you can now personalise this bean bag lap tray from Blue Badge Co with the photo of your choice, making it a great gift for your favourite relative. If you are looking for a lap desk that doubles up as something useful at the end of the day, this is the one. Even if you don’t go that extra step or personalising this item, you’ve still got a great lap tray on your hands, according to happy reviewers who praised the high quality of the product, loving its durable wipe-clean surface and customisability. Large, smooth surface? Check. Easy-on-legs tapered pillow? Check. That might be about all the slightly low-tech LapGear Lap Desk can offer, but really, what more could you want? The tray top is large enough to handle laptops up to 17 inches, with a handy elastic strap that’s great for keeping small items (like your phone) in check. It also comes in a number of patterns which make a nice change from the usual, and means it won’t look as out of place left out Gentlemen's Society - Black cushioned lap tray the house. Want a basic lap desk for home or on-the-go work? Go for this.